Business Planning - Devoted Enterprises Inc. Instead of a business pan, what if you could get a Business Success Plan? This is what we do for our clients! Have you ever heard the saying “all businesses go through these issues” or “it’s just growing pains”? The real reason you hear these sayings and that businesses experience them is that they do not have a written, planned and detailed success plan in their business. We will help you lay a solid foundation for the long term success of your business and you can even use this plan to help you get the funding that you need! What is Included in the Success Plan? 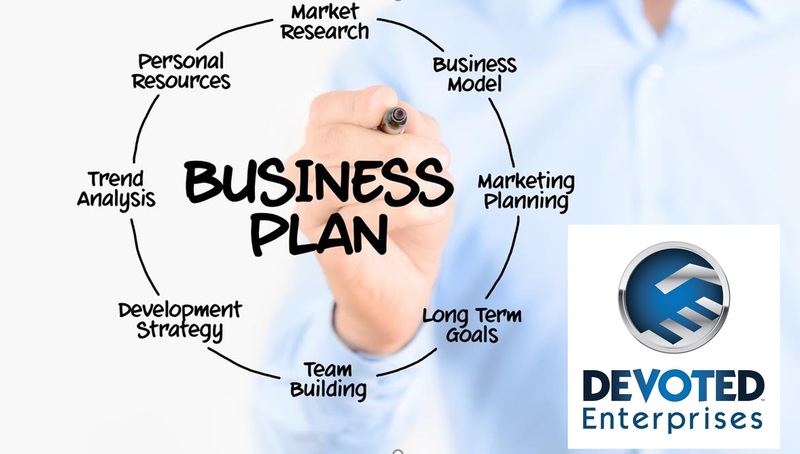 Our business success plan is unique because not only does it include things like projections, financials, business model details, and funding requirements and such that you can produce to help you get funding that you need, it also includes necessary items that “cheap”, “affordable” business plans do not have. In our business we include essential fundamental things such as a detailed business model explanation (that clearly explains how the business makes money), a business growth plan that covers not only growing the business, but the scalability of it. It also includes your full detailed marketing and advertising plan that is centralized around your business value proposition and will include all the marketing that you can do for free or little cost. It will not have ant fluff in it and will be straight to the point on how you grow and sustain your business! lastly, the plan will include a catastrophe plan and a custom exit plan that will allow you to have peace of mind knowing what will happen in the face of adversity. Whatever the business world can throw at you, this plan will help you survive. It is a pretty well known statistic that almost 90% of businesses fail in the first 10 years of business but what most do not know is why they fail. Likewise, only about 17% of the businesses that apply for businesses funding get the amount that they need, if they get any money at all. The reason for both of these amazing statistics is that these businesses are missing key components and planning in their business and those that have money and have done this long enough, can see that. Bottom line, if you want to be more than a statistic that has a high chance of failing and not getting the funding that you need, you need a Business Success Plan. To find out more, and inquire about pricing, please contact us at 952-582-4669.